Exit 16. Take the D181, direction Pacy-sur-Eure (turn on first roundabout on leaving the motorway). Take the N13, direction Pacy. Follow the signs "Train touristique de la Vallée de l'Eure". Get off in Vernon and take the bus at the corner of rue Montgomery and rue de Montigny (route 300 Gisors-Evreux). Get off in Pacy-sur-Eure. 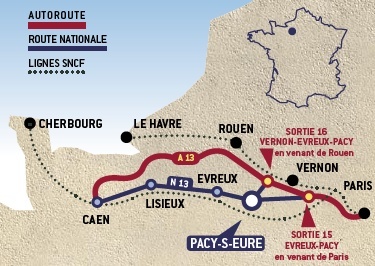 Get off in Evreux and take the bus in the bus station (route 300 Evreux-Gisors) and get off in Pacy-sur-Eure.